I’d just started the sunflower border quilting. Well I’ve managed at least a couple of evenings of quilting so I’ve made reasonable progress, I’ve now completed two sunflowers and a dresdon flower too, so I’m almost half way round this border. The insides of the Dresden flowers weren’t easy to quilt due to all the extra layers of fabric in seams extra, I ended up stab stitching most of it, so I was quite glad to move onto the next sunflower! I’ve not yet removed all the basting lines, so if you’re wondering what the straight lines are, that will be basting! When I’m feeling optomistic I look and think there’s only two narrow and one wide border left, when I’m not so positive I look at the size of the rabbit border and wonder when I’ll finally finish this quilt…slow but steady! I’ll also be linking up with Kathy’s Quilt for Slow Stitching Sunday. 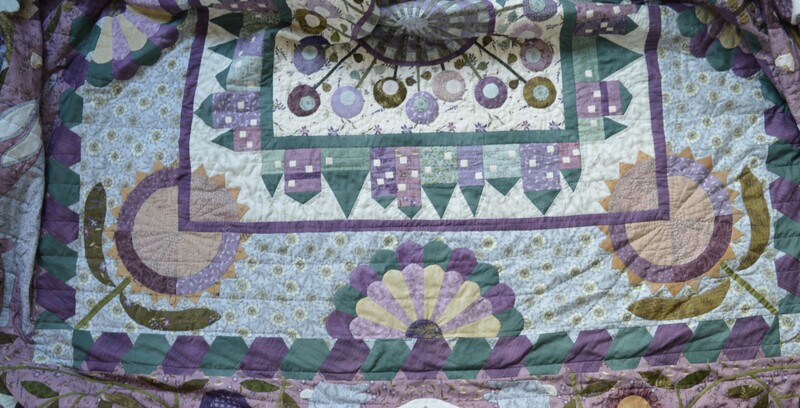 This entry was posted in Crafts, Down The Rabbit Hole, Quilt-a-long, Quilting. Bookmark the permalink. I can completely relate to “slow and steady”–I wish I was moving faster, myself. It looks lovely and it will be an heirloom–persist! 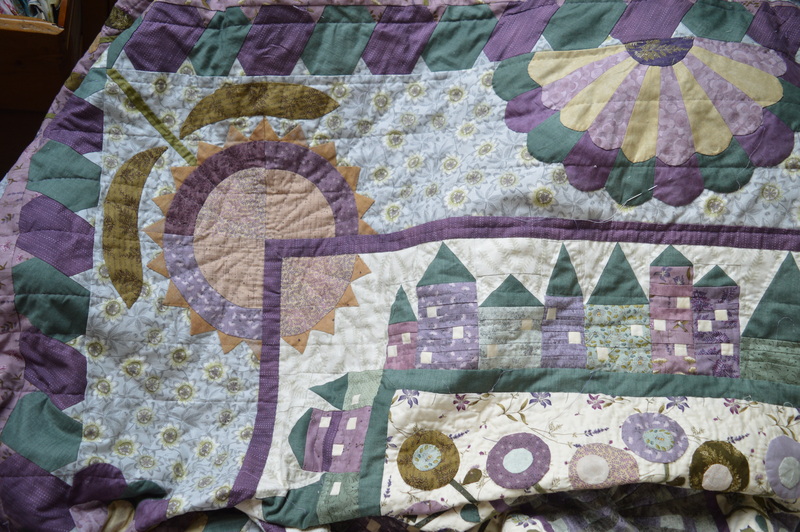 It will be worth it in the end – this is a beautiful quilt. So fun to see your progress on this. I have enjoyed watching you make this one. Exactly… slow and steady is how quilts get finished! It’s tough to hand quilt through multiple seams and that makes it really slow going and harder on your hands. Thanks for linking up to Slow Sunday Stitching and sharing your project! Love seeing your progress. I also love this quilt and your colors! Great work! Your getting there! You have chosen a hard quilt to do,and I think you are doing beautifully!